Now for part two of my series on my investment philosophy, asset-based/low expectations investing. In part one I described how investing in excellent companies and letting them compound over time can produce very attractive returns. Problem: these companies are very rare. Much more common are middling companies with middling competitive positions earning middling returns on equity. And then there are the underachievers: companies with eroding revenue bases, bloated operating structures, foolish or greedy management or a complete lack of concern for shareholders. This part addresses these unattractive companies. Profitable, growing business are typically valued by the market at some multiple of annual income or cash flow. Weak, loss-making or shrinking business are often valued by the market at the resale or liquidation value of the company’s assets less all liabilities. Let’s use an analogy. A strong business is like a healthy orchard of fruit trees. Each year the orchard produces a crop. The size of the crop varies from year to year with the weather, but over time the size of the crop increases as the trees grow and mature. 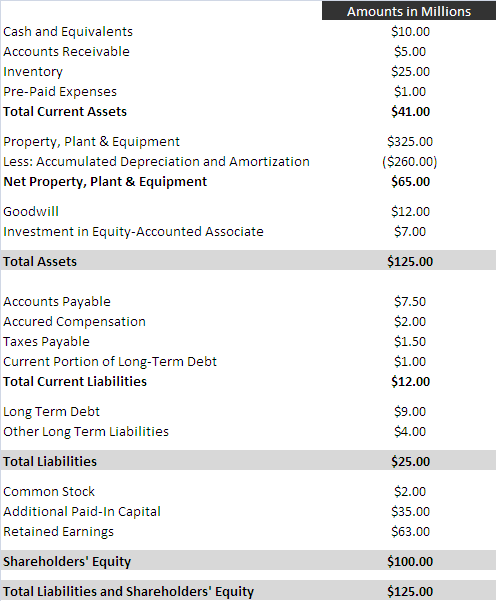 The value of this orchard is the present value of all future crops (less expenses), just as the value of a healthy company is the present value of all future free cash flows to equity. On the other hand, a weak business is like an orchard full of old, diseased or dying fruit trees. These trees do not produce a crop large enough to justify occupying valuable land. The typical buyer will not look at this orchard and try to value future crops. Instead he will survey the orchard and estimate how many cords of firewood the trees would make. While an investor would value the health orchard using an earnings-based approach, he would value the unhealthy orchard using an asset-based approach. In the first post of this series, we examined the fictional “Widgets ‘R Us Company,” an extremely high-quality, successful manufacturer. Now let’s examine “Sprockets ‘N Stuff,” WRU’s competitor. SNS has been in business since 1950 and has weathered many business cycles and changing markets, but at last seems to have run out of tricks. SNS’s plant and equipment is old and prone to breakdowns. Its chief product line is losing market share to WRU’s more innovative and better-made alternatives. SNS’s management is disengaged and spends as many hours on the golf course as in the office. What’s more, the company faces a class-action lawsuit from retired employees alleging exposure to toxic chemicals during their employment. Because of these issues and others, the company has not managed a profit in three years and sales are down 30% from their peak. Without any new products in the pipeline and with WRU competing more fiercely each quarter, SNS’s prospects are very dim. Though SNS has little value from an earnings-based perspective, it looks very strong from an asset-based perspective. SNS is financially healthy, at least for the time being. Current assets are more than three times current liabilities and total debt equals total cash. Liabilities make up just 20% of the total capital structure. Is $50 million an attractive price to pay for SNS’s “firewood” potential? Investors should recognize that financial statements rarely tell the whole picture in a liquidation scenario. Unless otherwise noted, company financial statements are prepared on a going-concern basis that assumes the company will operate indefinitely. Balance sheet values can suddenly look very different when liquidation comes into play. Let’s make some necessary adjustments to SNS’s balance sheet to better reflect a liquidation scenario. The notes to a company’s financial statements are absolutely essential reading. In them, a company often reveals critical information that can dramatically change an investor’s calculation of a business’s value. Let’s say we carefully examine SNS’s financial statement notes and have come up with the following relevant items. Inventories – SNS has $25 million in book inventory, but the company reveals a $20 million LIFO reserve in the notes. LIFO (last in, last out) is an accounting treatment available to US manufacturers that essentially increases cost of goods sold, decreases taxable income and artificially deflates the book value of inventory. A detailed explanation is available here. Companies that have operated and grown for many years in an environment of increasing inventory costs can have substantial LIFO reserves. Real Estate – Net of depreciation and amortization, SNS has $65 million in property, plant and equipment on its books. In its notes, the company reveals this amount breaks down to $10 million in land, $5 million in buildings and improvements and $50 million in equipment. Under US GAAP, the value of company land is recorded at cost. Because land has tended to appreciate over time in many areas, the market value of land is often higher than its book value. Looking back at older financial statements, it appears this $10 million in land was purchased some time in the 1970s. Assuming a 1975 purchase date and 2% annual appreciation, this land how has a market value of $21.2 million. This value may still be understated given the periods of high inflation that have occurred in the interim. Regardless of the exact figure, this appreciated land is a source of hidden value. Investment in Equity-Accounted Associate – SNS’s notes include a discussion of a 10% stake it owns in an affiliated company, SNS Europe. Because SNS’s stake in SNS Europe is small, the company uses the equity method of accounting for its investment, recording its cost and then adding its proportional share of SNS’s Europe’s profits to its book value each year. Last year this amount was $1 million because SNS Europe’s yearly profit was $10 million. SNS Europe is a healthy company with none of the issues facing SNS, and is probably worth at least 10 times earnings, or $100 million. Although SNS’s stake in SNS Europe is carried on the balance sheet at $7 million, the stake could likely be sold for $10 million or more. There are many sources of hidden value that don’t appear at first glance. However, there are also hidden liabilities. SNS notes a few of those as well. Litigation – While SNS is being sued by former employees, it has not recorded a liability on its balance sheet because it “believes the allegations are without merit and intends to mount a vigorous defense.” Though the company seems confident, investors without some advanced knowledge of the strength of the claims (that is, virtually everyone) should be cautious and assume the company will bear at least some liability. SNS notes the suit against it is claiming $5 million in damages, and investors should include at least the majority of this amount in any calculation of liquidation value. Take or Pay Contracts – SNS notes that because its input costs are volatile, it has entered into contracts with several suppliers guaranteeing prices for the next three years on $12 million of inputs. These contracts are “take or pay” contracts, meaning SNS is responsible for payment even if it does not take delivery of the inputs. In a liquidation scenario, SNS will be responsible for paying off or otherwise discharging these contracts. Perhaps the company could sell these contracts to a competitor or otherwise settle with the suppliers, but investors should conservatively assume a negative outcome. Golden Parachutes – In SNS’s proxy statement it discloses certain benefits due to management if for any reason the company ceases to operate or otherwise undergoes a restructuring resulting in termination of management’s employment. If management is terminated (with or without cause) then $11 million in deferred compensation accelerates and all management’s stock options vest immediately. This stipulation may seem egregious given the size of the company, but arrangements like this are all too common, especially in companies with poor corporate governance and absentee boards of directors. 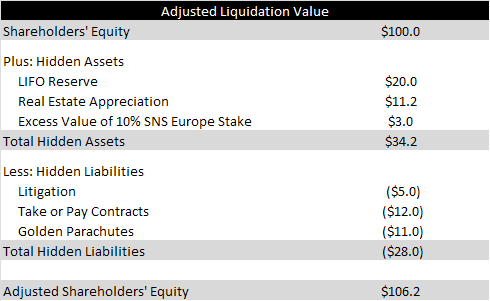 Having looked at potential hidden assets and liabilities, here is SNS’s adjusted liquidation value. With a market capitalization of $30 million, it seems as though SNS is trading at a steep discount to liquidation value. Not so fast! 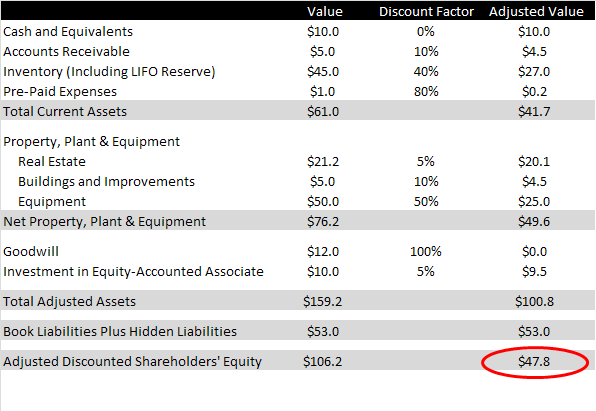 This analysis assumes that if all the company’s assets were sold off, full book value could be realized. Unfortunately, this is rarely the case. Liquidation analysis take these issues into account by applying discounted valuations to a company’s assets. Assets with good liquidity like cash and accounts receivable are given small discounts, while illiquid assets such as equipment are given large discounts. Intangible assets like goodwill are usually given no value at all. Let’s set about applying discounts to SNS’s assets. After applying reasonable discounts to SNS’s assets, it appears the company trades at a 37% discount to liquidation value. Keep in mind that we still have not included possible expenses like legal fees, auction fees or taxes due on the sale of appreciated real estate or securities. What’s more, liabilities have a nasty habit of inflating when a company is on its way to oblivion. When it comes to liquidation analysis, conservatism is the name of the game. When valuing companies on the basis of net assets, investors should seek to buy in only at a significant discount to a conservatively estimated value of net assets. There are several other factors that investors must consider when investing based on an asset-based/liquidation thesis. Time – When investing in high-quality, compounding companies, time is one’s friend. With every month and year that passes, a high-quality company will be generating free cash flow, making solid investments and building its brand. Low-quality companies, on the other hand, are destroying value by generating losses, burning through working capital or simply meandering along at break-even and tying up valuable investor capital. Because each day represents a loss of economic value and/or an opportunity costs, investors in low-quality companies are hoping and praying for a change to come sooner rather than later. The longer things go on without a change in strategy, management or economic conditions, the greater the likelihood of a permanently-impaired investment. Management – Like time, management is the friend of the investor in high-quality companies but often the foe of investors in low-quality enterprises. After all, there is often a human reason for a company’s poor performance, be it a foolish acquisition, ignorance of customer needs or sheer repeated boneheaded decisions. Investors in low-quality companies should assess the likelihood that management can be persuaded to shift course or if activist investors could be successful in replacing the worst of the worst. The more entrenched management is and the weaker the board, the less likely that investors can hope for change. Certainty – The composition of a company’s assets and liabilities is tremendously important. Companies with large cash balances and lots of liquid assets are typically safer than companies with balance sheets dominated by depreciated equipment. Companies that are primarily-equity financed are generally safer than those with high liabilities to assets. Investors should adjust the “margin of safety” they demand for the composition and quality of a company’s assets. Riskier liquidation scenarios require much larger discounts to net asset value. The Pain Factor – Holding low-quality, continually wheel-spinning companies can hurt. Just as high-quality companies are reporting higher book values and profits, low-quality companies will frequently be reporting yet another profitless quarter and dubious product launch. It’s easy to question the logic of investing at all. However, those with patience and confidence in these companies’ asset values may find themselves rewarded down the line. So, what now? Can a strategy based on investing in companies trading at a fraction of conservatively-estimated liquidation value and then waiting for liquidation to occur provide attractive returns? The truth, as it usually is in life, is more complicated. Perhaps the biggest problem is one of finding opportunities. Just as only a small set of companies truly can compound value for decade after decade, surprisingly few companies actually liquidate. Sure, failing companies go through the bankruptcy process regularly, but many of these companies restructure and emerge once again as going concerns. Others liquidate, but yield nothing to equity investors as senior claims dwarf assets. Only a tiny number of companies go through the liquidation process and make distributions to shareholders. But, here’s the thing. When investing in companies on an asset-based or liquidation basis, you shouldn’t actually hope for liquidation. Sure, sometimes liquidation works out well, but more often it represents the failure of a company to regain its health and profitability and results in a total loss for shareholders. Rather than hoping to gain through the liquidation process, an investor should hope to gain through low expectations and mean reversion. Companies that trade at a fraction of their liquidation values all have one thing in common: low expectations. These companies, with their loss-making operations, eroding revenue streams, bumbling management and demoralized employees are expected to go on doing the exact same thing until they reach bankruptcy court. Nobody is surprised when a quarterly report comes in and the company reveals continued losses and no reasonable hope of better things to come. That’s why whenever one of these companies does reveal a positive development, their shares can respond dramatically. It’s the reverse of the phenomenon often seen with high-profile growth stocks like Amazon.com or Netflix. Investor expectations for these companies are sky high. When Amazon.com releases quarterly earnings and revenues are up 20%, the share price may not move because everyone expected a great performance. On the other hand, if Amazon.com reports quarterly growth of only 10%, shares plummet because the market hates to be disappointed when expectations are lofty. Let’s go back to the orchard analogy for a moment. One day a wise investor goes out and examines 10 orchards full of diseased and dying trees. After examining each orchard, she offers to buy each for $10,000 dollars, having estimated that chopping down the trees would yield $15,000 per orchard after all expenses. Meanwhile, a healthy orchard goes for $50,000. She spends $100,000 buying these 10 orchards. All of her investing friends laugh at her behind her back. This crafty investor is unfazed because she knows that in a worst case scenario, she can profit $50,000 by “liquidating” the orchards. However, she also knows that some of these orchards have life left in them, that some of them will recover their vitality and resume producing crops. Which ones, she is not sure, hence the purchase of 10 orchards. A year goes by. One of the orchards fights off the fruit blight that was afflicting it and becomes an unusually productive orchard worth $75,000. Another two orchards regain a portion of their health and produce a small crop, raising their value to $25,000. Five of the orchards experience no change in their conditions, leaving their value unchanged at $10,000 each. And finally, two of the orchards are inundated when a river changes course, putting them under water and wiping out their value completely. The investor sells all of the properties she bought last year for proceeds of $175,000, earning a substantial profit. What the investor used to her benefit was the phenomenon of mean reversion. In economic terms, mean reversion describes the tendency of companies (and a lot of other things) exhibiting extreme characteristics to revert to average (mean) characteristics over time. A multitude of studies have recorded the tendency of companies producing high returns on equity to produce returns on equity closer to the industry average in following periods. By the same token, companies recording poor returns on equity have a tendency to see their returns on equity increase as time passes. The reasons for this tendency are many, but they include the effects of competition as competitors enter high-return businesses and exit low-return businesses. Investors can accomplish the same by purchasing baskets of securities that are priced at a fraction of liquidation value. While a few of these companies will likely be total wash-outs as net asset value declines to zero, a few of these companies are likely to turn around and produce outstanding returns. It is extremely difficult to determine in advance which will languish and which will thrive, hence the basket approach recommended by Benjamin Graham. While SNS may or may not recover, a basket of firms in different industries also trading at a discount to liquidation value will very likely contain some big winners. Opportunities like these are available within the ranks of unlisted securities. In fact, I think they are relatively more abundant than among the ranks of NYSE and NASDAQ-listed companies. I cover several hundred unlisted stocks, most of which are profitable and have solidly positive book values. Of these, over one hundred trade at a discount to book value. I suspect many of these have hidden assets much like our fictional SNS. An even more conservative measure of liquidation value uses a methodology known as “net current asset value.” “Net-nets,” as they are called, are stocks which have a market value that is less than the value of their current assets less all liabilities. The theory behind this methodology is that current assets tend to be liquid and their value more or less objective. Purchasing a company for less than the value of these current assets less all liabilities entails receiving all non-current assets for free. Benjamin Graham recommended purchasing these securities at 66% or less of their net current asset value and waiting for convergence. Unfortunately, the years-long market rally has all but eliminated these opportunities. Whereas there were hundreds of net-nets at the end of 2008, I now know of only 50 or so that trade on the pink sheets or the OTCBB. In my experience, the returns of asset-based/low expectations tend to be cyclical. The greatest returns come at the beginning of economic expansions as companies that were once left for dead show signs of life. Most investors will benefit from some strategy diversification in their portfolios. Owning both high-quality compounding companies and baskets of low-quality mean reversion can provide some protection during contractions as well as some enhanced upside during expansions, so long as one has the courage to invest in low-quality companies just as things seem the darkest. Thanks for reading! I will be back next week with the third and final part of this series on my basic investment philosophy – Information Flow Investing. Excellent, very well written and well thought out. Your series could be several classes in a business school. Or read for free here and get an excellent education. My thanks, and Keep up the good work!